Acrylonitrile butadiene styrene (ABS) (chemical formula (C8H8)x·​(C4H6)y·​(C3H3N)z) is a common thermoplastic polymer. Its glass transition temperature is approximately 105 °C (221 °F). ABS is amorphous and therefore has no true melting point. ABS is a terpolymer made by polymerizing styrene and acrylonitrile in the presence of polybutadiene. The proportions can vary from 15 to 35% acrylonitrile, 5 to 30% butadiene and 40 to 60% styrene. The result is a long chain of polybutadiene criss-crossed with shorter chains of poly(styrene-co-acrylonitrile). The nitrile groups from neighboring chains, being polar, attract each other and bind the chains together, making ABS stronger than pure polystyrene. The styrene gives the plastic a shiny, impervious surface. The polybutadiene, a rubbery substance, provides toughness even at low temperatures. For the majority of applications, ABS can be used between −20 and 80 °C (−4 and 176 °F) as its mechanical properties vary with temperature. The properties are created by rubber toughening, where fine particles of elastomer are distributed throughout the rigid matrix. The most important mechanical properties of ABS are impact resistance and toughness. A variety of modifications can be made to improve impact resistance, toughness, and heat resistance. The impact resistance can be amplified by increasing the proportions of polybutadiene in relation to styrene and also acrylonitrile, although this causes changes in other properties. Impact resistance does not fall off rapidly at lower temperatures. Stability under load is excellent with limited loads. Thus, by changing the proportions of its components, ABS can be prepared in different grades. Two major categories could be ABS for extrusion and ABS for injection moulding, then high and medium impact resistance. Generally ABS would have useful characteristics within a temperature range from −20 to 80 °C (−4 to 176 °F). Lego bricks are made from ABS. The final properties will be influenced to some extent by the conditions under which the material is processed to the final product. For example, molding at a high temperature improves the gloss and heat resistance of the product whereas the highest impact resistance and strength are obtained by molding at low temperature. 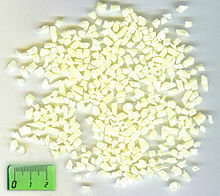 Fibers (usually glass fibers) and additives can be mixed in the resin pellets to make the final product strong and raise the maximum operating temperature as high as 80 °C (176 °F). Pigments can also be added, as the raw material original color is translucent ivory to white. The aging characteristics of the polymers are largely influenced by the polybutadiene content, and it is normal to include antioxidants in the composition. Other factors include exposure to ultraviolet radiation, which additives are also available to protect against. ABS polymers are resistant to aqueous acids, alkalis, concentrated hydrochloric and phosphoric acids, alcohols and animal, vegetable and mineral oils, but they are swollen by glacial acetic acid, carbon tetrachloride and aromatic hydrocarbons and are attacked by concentrated sulfuric and nitric acids. They are soluble in esters, ketones, and ethylene dichloride. Even though ABS plastics are used largely for mechanical purposes, they also have electrical properties that are fairly constant over a wide range of frequencies. These properties are little affected by temperature and atmospheric humidity in the acceptable operating range of temperatures. ABS is flammable when it is exposed to high temperatures, such as those of a wood fire. It will melt and then boil, at which point the vapors burst into intense, hot flames. Since pure ABS contains no halogens, its combustion does not typically produce any persistent organic pollutants, and the most toxic products of its combustion or pyrolysis are carbon monoxide and hydrogen cyanide. ABS is also damaged by sunlight. This caused one of the most widespread and expensive automobile recalls in US history due to the degradation of the seatbelt release buttons. ABS can be recycled, although it is not accepted by all recycling facilities. ABS is derived from acrylonitrile, butadiene, and styrene. Acrylonitrile is a synthetic monomer produced from propylene and ammonia; butadiene is a petroleum hydrocarbon obtained from the C4 fraction of steam cracking; styrene monomer is made by dehydrogenation of ethyl benzene — a hydrocarbon obtained in the reaction of ethylene and benzene. ABS combines the strength and for its hardness, gloss, toughness, and electrical insulation properties. According to the European plastic trade association PlasticsEurope, industrial production of 1 kg (2.2 lb) of ABS resin in Europe uses an average of 95.34 MJ (26.48 kW⋅h) and is derived from natural gas and petroleum. ABS is easily machined. Common machining techniques include turning, drilling, milling, sawing, die-cutting and shearing. ABS can be cut with standard shop tools and line bent with standard heat strips. ABS can be chemically affixed to itself and other like-plastics. Naturally colored ABS 3D bell manufactured with a 3D printer. ABS's light weight and ability to be injection molded and extruded make it useful in manufacturing products such as drain-waste-vent (DWV) pipe systems, musical instruments (recorders, plastic clarinets, and piano movements), golf club heads (because of its good shock absorbance), automotive trim components, automotive bumper bars, medical devices for blood access, enclosures for electrical and electronic assemblies, protective headgear, whitewater canoes, buffer edging for furniture and joinery panels, luggage and protective carrying cases, small kitchen appliances, and toys, including Lego and Kre-O bricks. Household and consumer goods are the major applications of ABS. Keyboard keycaps are commonly made out of ABS. ABS plastic ground down to an average diameter of less than 1 micrometer is used as the colorant in some tattoo inks. Tattoo inks that use ABS are extremely vivid. When extruded into a filament, ABS plastic is a common material used in 3D printers. ABS is stable to decomposition under normal use and polymer processing conditions with exposure to carcinogens well below workplace exposure limits. However, at higher temperatures (400 °C) ABS can decompose into its constituents: butadiene (carcinogenic to humans), acrylonitrile (possibly carcinogenic to humans), and styrene. Ultrafine particles (UFPs) may be produced at lower temperatures during the 3D printing process. Concerns have been raised regarding airborne UFP concentrations generated while printing with ABS, as UFPs have been linked with adverse health effects. ^ "Matbase". Retrieved 3 July 2014. ^ May, James (2009). James May's Toy Stories. London: Conway. ISBN 978-1-84486-107-1. ^ Rutkowski, J. V.; Levin, B. C. (1986). "Acrylonitrile-butadiene-styrene copolymers (ABS): Pyrolysis and combustion products and their toxicity?a review of the literature". Fire and Materials. 10 (3–4): 93. doi:10.1002/fam.810100303. ^ Henshaw, J. M.; Wood, V.; Hall, A. C. (1999). "Failure of automobile seat belts caused by polymer degradation". Engineering Failure Analysis. 6: 13–25. doi:10.1016/S1350-6307(98)00026-0. ^ "Belts recalled in 8.4 million vehicles". The Baltimore Sun. Knight-Ridder News Service. May 24, 1995. Retrieved November 16, 2015. ^ "ABS Recycling". Heathland B.V. Archived from the original on 2014-03-06. Retrieved 2013-12-31. ^ "Recycling plastic". Brisbane City Council. Retrieved 2013-12-31. ^ Boustead, I (March 2005). Acrylonitrile-Butadiene-Styrene Copolymer (ABS) (Technical report). Eco-profiles of the European Plastics Industry. PlasticsEurope. ^ Hammond, G. P.; Jones, C. I. (2008). "Embodied energy and carbon in construction materials". Proceedings of the ICE – Energy. 161 (2): 87. doi:10.1680/ener.2008.161.2.87. ^ "ABS Plastic Sheet, Rod, Tube and Accessories". Interstate Plastics. Interstate Plastics. Retrieved September 23, 2016. ^ ABS – acrylonitrile butadiene styrene On Designsite.dk, lists applications. Retrieved 27 October 2006. ^ "Keycap Construction: ABS". Deskthority. September 2014. ^ "The Free Beginner's Guide". www.3dprintingindustry.com. 3D Printing Industry. Retrieved 30 May 2016. ^ a b Unwin, John (2013). "Airborne emissions of carcinogens and respiratory sensitizers during thermal processing of plastics". Annals of Occupational Hygiene. 57 (3): 399–406. doi:10.1093/annhyg/mes078. PMID 23091110. ^ Azimi, Parham; Zhao, Dan; Pouzet, Claire; Crain, Neil E.; Stephens, Brent (2016). "Emissions of Ultrafine Particles and Volatile Organic Compounds from Commercially Available Desktop Three-Dimensional Printers with Multiple Filaments". Environmental Science & Technology. 50 (3): 1260–1268. doi:10.1021/acs.est.5b04983. ISSN 0013-936X. PMID 26741485. ^ Stephens, Brent (November 2013). "Ultrafine particle emissions from desktop 3D printers". Atmospheric Environment. 79: 334–339. doi:10.1016/j.atmosenv.2013.06.050. Wikimedia Commons has media related to Acrylonitrile butadiene styrene.